Are you a bird lover? Pennington Wild Bird seed attracts all kinds of birds to your feeder and yard. 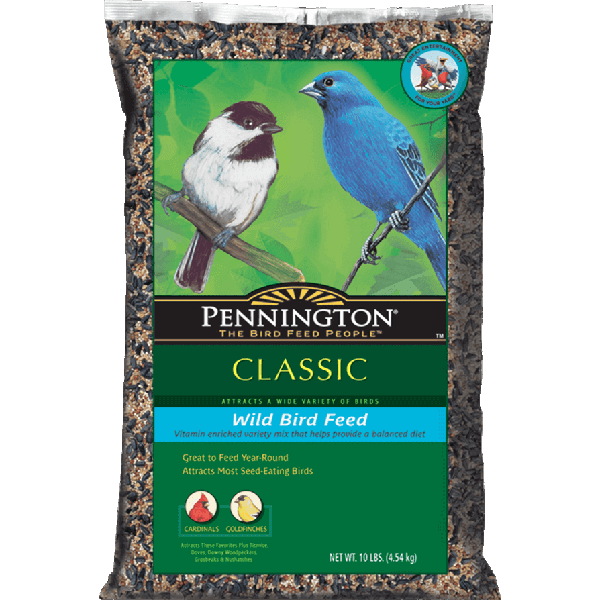 Pennington® Classic Wild Bird Feed attracts most seed-eating birds and is great to feed year-round. Vitamins and mineral supplements are added to the food to create an enriched diet that birds love. This feed attracts Cardinals, Goldfinches, Titmice, Doves, Downy Woodpeckers, Grosbeaks, Nuthatches and more. We know this bird seed will exceed your expectations, so we have a frequent purchase program. Buy 12 bags of Pennington Wild Bird Seed in 20 lb or 40 lb bags and Get One Free of the Same Size. Stop by Standley Feed & Seed today to start your Frequent Buys Club Card. This entry was posted on Friday, November 18th, 2016 at 4:14 pm	and is filed under News & Updates. You can follow any responses to this entry through the RSS 2.0 feed. Both comments and pings are currently closed.